Similar dresses for the queen and Crown princess Mary.I don't like the outfits of Marie,sorry! But her hairstyle is nice. Different pattern but regal on both Queen and C Princess (they may have coordinated). Queen Margrethe ll like HM is very stylish and not afraid of bright colours. 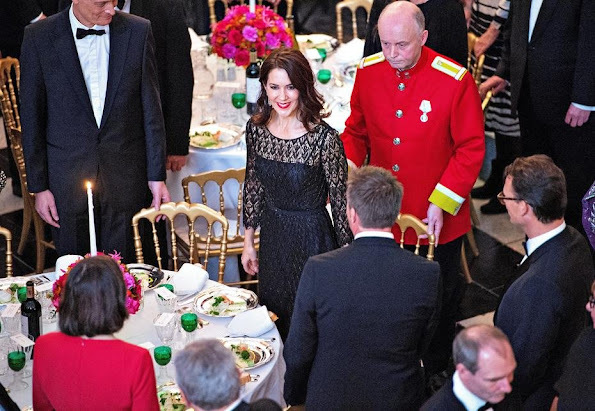 Crown Princess Mary is regal and royal elegance in lace!. This is how lace should be worn and at an appropriate event, lovely! And where are Joachim and Frederik? Mary and Marie seem to work a lot more than the husbands. 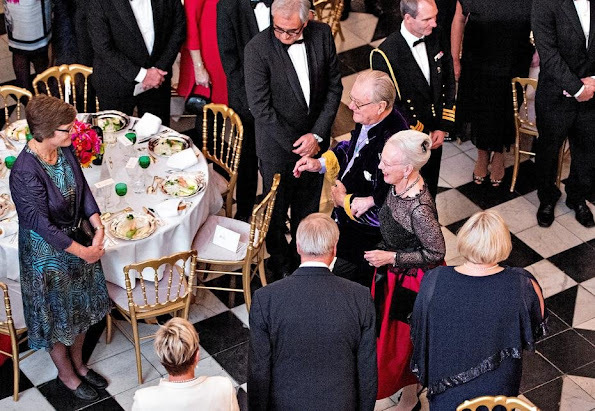 The style of Queen Margrethe and Mary very often matches each other for events. Marie's nerver does. A brooch on Marie's bluses right shoulder had lifted it up, a belt too… now it just looks untidy. She needs a stylist!!!! 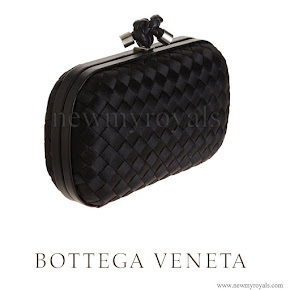 Mary's dress is similar to Middleton's Dolce & Gabbana's dress. Lovely to see both daughters-in-law out with the King and Queen! Lovely to see the king and queen with their two beautiful daughters in law! 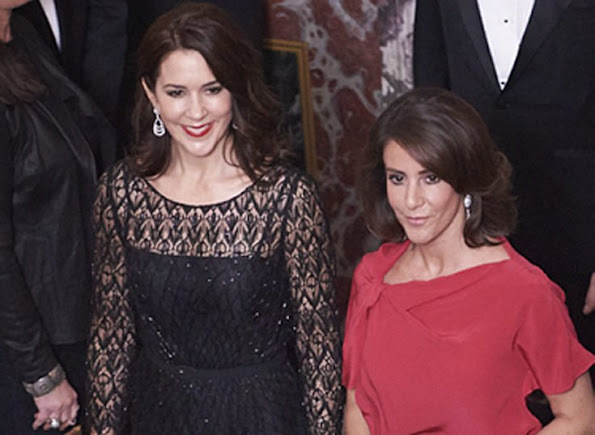 Crown Princess Mary looks stunning, very, very elegant. I hate to say this, but poor Marie's ensemble is badly coordinated. Her outfit looks as though it has been thrown together in the last moment. The only positive is that she isn't orange for a change, and that is a real plus! Marie really needs to employ a stylist..
Mary looks very old, is she 47? 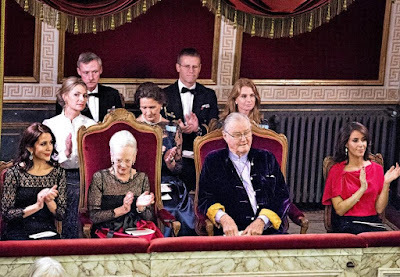 What a coincidence that Crown Princess Mary worn a lace dress for an evening function just like Your Royal Highness Duchess of Cambridge and Crown Princess Mary's hair is loose with a fringe!!!!! She is regal, but where are all the hateful, cruel and disgusting comments now from the fashion connoisseurs???!!! 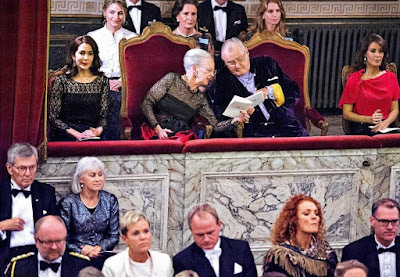 This I find very amusing, but great to see Your Royal Highness Duchess of Cambridge stylish attire and looks rubs off on the Crown Princess Mary of Denmark. Catherine can't hold a candle to Mary. And not only regarding lace dresses. who is Mary in the pic. and who is Marie??? very similar, almost identical faces, as twins!! I don't think so. Same names and same hair colour that's it. Mary is of scottish origin, she is much taller, fairer, and is quite nicely built. 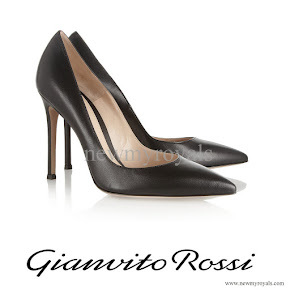 French Marie is short, with a very dark completion and has a slender silhouette. And it's a personal opinion, but I would say the Crownprincess is always stylish, and I can't say the same for Princess Marie. I love Marys lace dress. But the red lipstick makes her look older than she is. I do not like Maries outfit; the colours suit her, but the clothes do not match and do not fit. 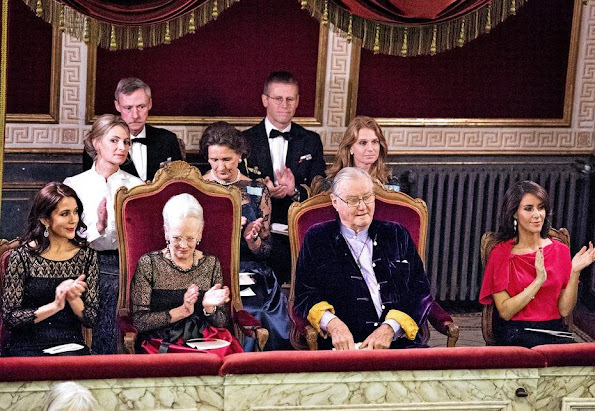 I adore that the colours of the outfit of the Queen match those of her daughters-in-law. It is lace like Marys and the same colours like Marie. 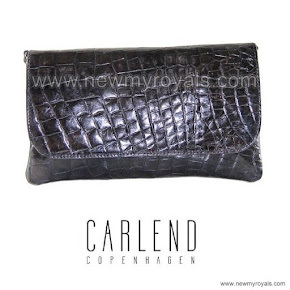 I seriously doubt Crown Princess Mary would copy Kate. Princess Mary has her own style and taste, and she changes her hair style according to the event and what she is wearing. She us always beautifully groomed unlike Kate. Kate on the other hand could learn a lot from Mary. She really needs to do something with her hair. She has beautiful hair, but she does nothing with it. It hangs down around her face looking dreadful, making her look so much older than she actually is. Kate needs to get her hair cut and styled. As for Mary's lovely gown, Mary wore a gown very similar to the one Kate wore recently several years ago. so who is copying whom?